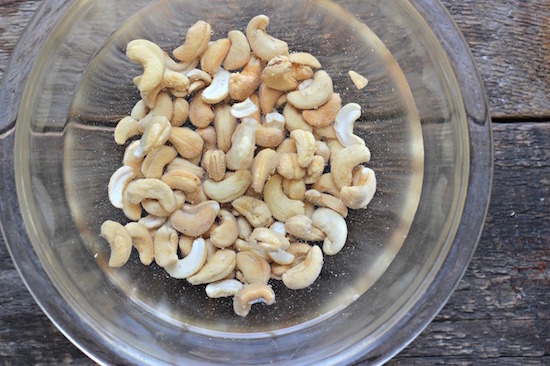 Place nuts in food processor with the ‘S’ blade and process until finely ground. Add remaining ingredients except water and process until mixture begins to stick together. Gradually add water until sticky. Garnish with chopped pecans and fresh berries. Spread into a 9X12 dish coated in coconut oil. Let set up in the frig. Alternatively, roll into balls then roll in shredded coconut and refrigerate to set. pan to form the crust. blueberries and pour on top of crust. Pie will set up in less than 10 minute. Eat at room temp or refrigerate for up to 3 days. 1. First grind the almonds in a food processor, add the dates, and mix well. Place in a bowl and hand mix in the diced strawberries. 2. Next, combine the remaining ingredients, minus 1/2 cup of strawberries, in the food processor and mix until smooth. Pour into a bowl and add the 1/2 cup strawberries in slices. Mix and pour into crust. Blend all ingredients in a food processor until well combined. Take spoonfuls and roll into balls then in coconut flakes or cacao powder and cinnamon. Alternatively, press into a coconut oil lined glass casserole dish. 1. TORTE: In food processor, combine raisins and walnuts and blend until well blended and moist. (This will take a few minutes and you may see it forming a ball. Just make sure the raisins come out looking like a fudgy mixture and are not still grainy). 2. Remove from processor and mold onto plate in a round circle about 1½ inches thick. 1. Mix first 3 ingredients in a bowl. 2. Press halvah into glass baking dish. 3. Press finely ground almonds on top, cover and store in freezer. Blend coconut oil and agave nectar in blender for 2 minutes. Add cacao butter and mix until melted completely. Start with 5 drops of lavender oil and mix. Add cacao powder while mixing. Taste to ensure the lavender oil is adequate. If taste is right, continue adding cacao powder until the Vitamix has trouble. Pour into molds or into a casserole dish and place in freezer until hard. Pop out of molds or slice in casserole dish and enjoy. Combine almonds, flax, vanilla and ginger in a bowl and mix well. 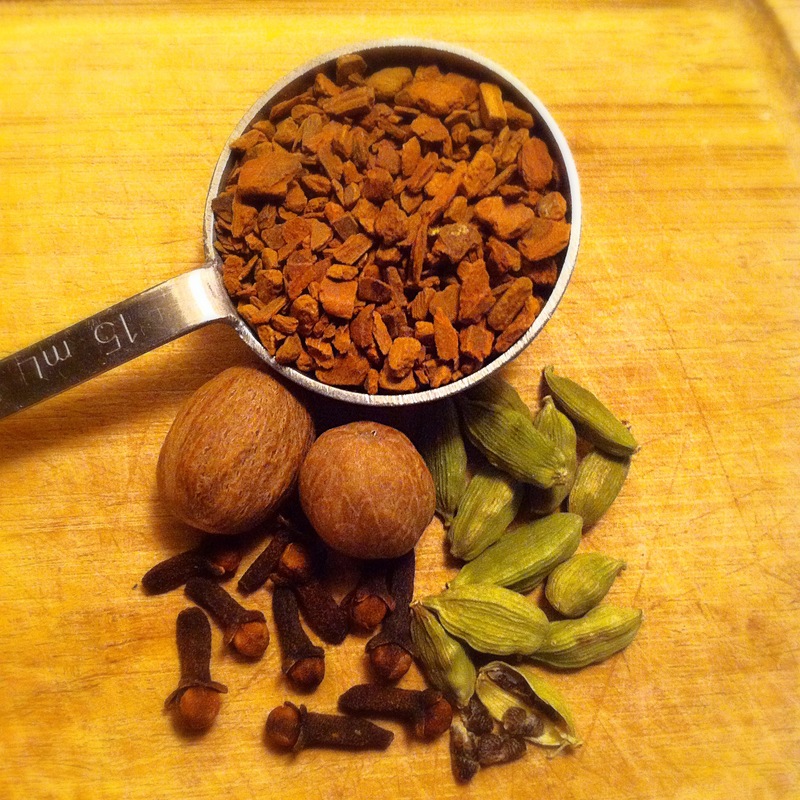 In food processor, briefly process pecans with salt and spices. Add dates and continue processing until it has a crust-like consistency. Combine everything in a bowl and hand mix until well combined. Form into a 3 inch thick log, cut in ½ inch slices, and form into cookie shapes. Place on mesh sheets and dehydrate at 145 degrees for 2 hours. Turn temperature down to 115 and continue to dehydrate for another 24 hours. Cookies should still be slightly moist on the inside. 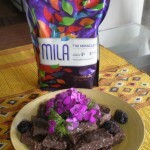 Variations: use any dried fruit or berry (gojis, mulberries, apricot, etc. ), or try walnuts instead of pecans. 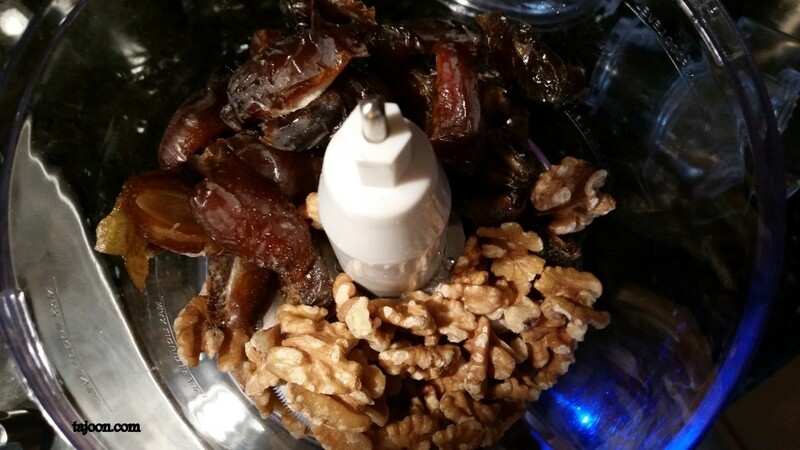 Grind walnuts in food processor until fine. Add the remaining ingredients and blend until creamy. Process raisins, zucchini, and vanilla bean in Vitamix until smooth; add some of the raisin soak water to blend. Process pecans in food processor with “S” blade until mealy. Combine all ingredients in a bowl, except ground flax, and mix well. Add flax in 3 increments, mixing well. The dough will really stiffen up. Split dough and form into 2 loaves. 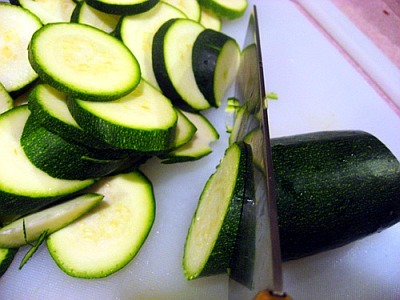 Slice into ¼” pieces and place on Teflex sheets. Dehydrate at 145 o for 2 hours, flip onto mesh sheets and continue to dehydrate at 115 o for 2-4 hours or until desired moisture is obtained. Crumble topping: Process 1 cup walnuts, 1 cup pecans, ½ cup coconut, ½ tsp cinnamon, ½ tsp nutmeg, ¼ tsp salt and ½ tsp cardamom in a food processor until coarsely ground. Add ½ cup currants and 8 dates and continue to process until coarse crumbs form and begin to stick together. Add the palm sugar and pulse a couple times to mix. Filling: Process 1 apple, ½ cup dates, ½ cup currants, ¼ tsp cinnamon in food processor until smooth. Assembly: First mix apple slices and the filling in a bowl and dehydrate for 1-2 hours at 145o. 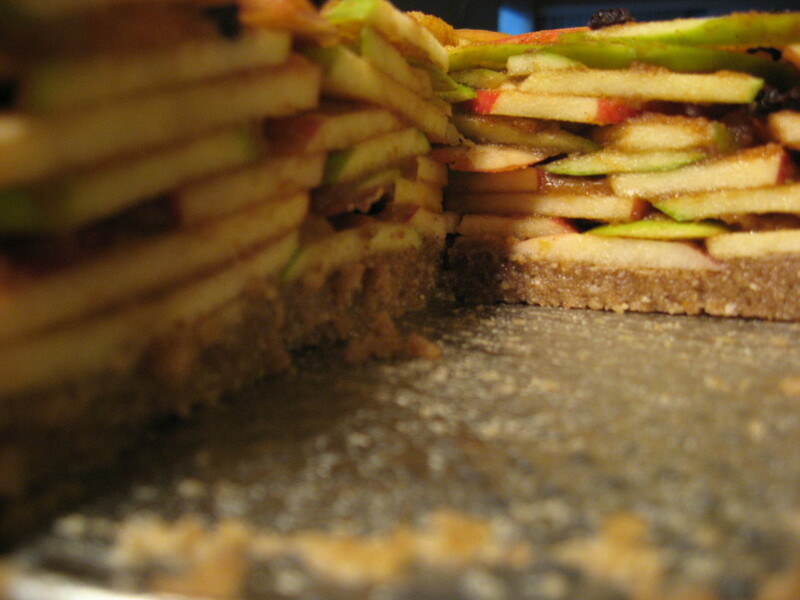 Begin assembling the pie by placing a layer of apple slices then some filling mix. Repeat adding a little crumble topping in between layers with the rest on top. Dehydrate for 2 hours at 145o. Dehydrate again before serving for 1-2 hours at 115 o. Best served warm. Best eaten within 3 days. Crust: blend almonds and dates until smooth (first 2 ingredients). Press into a pie plate. Filling: Blend pumpkin or squash in food processor for several minutes. Add remaining ingredients and blend until smooth. Place filling on top of pie crust and refrigerate. Best served chilled. Add all ingredients except coconut oil and lecithin. Blend well until smooth and creamy. Stop the blender and add the coconut oil and lecithin. Resume blending until well incorporated. Refrigerate to harden into a whipped cream consistency. Will last for about 3-5 days….unless you eat it all up before then!